After meeting with Russian President Vladimir Putin on Tuesday, Prime Minister Binyamin Netanyahu on Wednesday held a conference with the leaders of Moscow's Jewish community where he spoke about Israeli activity in Syria. The event, which was held during Netanyahu's official visit to Russia, was attended by around 100 community leaders and businessmen including Russian Chief Rabbi Berel Lazar, Moscow Chief Rabbi Pinchas Goldschmidt and Russian Jewish Federation chief Yuri Kanner. During the meeting, Netanyahu was asked about Syria and the future of relations with Syrian President Bashar al-Assad, whose regime is being propped up primarily by Russian and Iran. "You ask about the future of (Israel’s) relations with President Assad? I would ask what is the future of President Assad in general?," replied Netanyahu, noting on the internecine civil war that has raged since 2011. 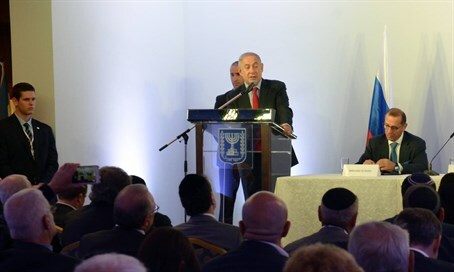 He clarified that Israel is ensuring it will not be attacked from Syria by taking occasional action, and said the IDF will strike Syrian and Iranian troops or Hezbollah terrorists and members of other Islamist groups in the region if they pose a threat to the Jewish state. "There are enough enemies. My policy is to take all necessary steps to prevent attacks, and we act from time to time when the need arises," he acknowledged. The statement is one of the few times Netanyahu has admitted Israeli activity over the border. While Arab reports had long alleged that Israeli jets conducted airstrikes on arms transfers for Iran's Lebanese terror proxy Hezbollah, Israel has remained tight-lipped on the subject. However, last December Netanyahu acknowledged that Israel is active in Syria. In his remarks on Wednesday regarding Syria, Netanyahu added that, "I also ordered to build a field hospital that helped thousands of Syrians, babies, children, women, and men, with awful wounds. We are treating them there and at our hospitals. Humanitarian aid and a firm stand on our lines for the security of Israel." Noting on the fractured nature of Syria, he said, "I don't know if it is possible to turn the Syrian omelette back into an egg." "The countries around us, Syria among them, some of them have already split apart, and therefore a different arrangement is needed. I spoke with President Putin about this at length, and the important thing is that what replaces them (the countries) doesn't bring more tragedies and does not endanger our countries." While Netanyahu did not elaborate what the "different arrangement" in the Middle East that he spoke with Putin about would consist of, he recently has expressed willingness to hold negotiations with the Palestinian Authority (PA) as well as states such as Egypt in working on a regional peace deal. Details of what such a deal might entail remain unclear. Netanyahu also noted on the growing ties between Israel and Russia during the meeting, and thanked the Jewish leaders for being instrumental in making that happen.